Is the economy bumming you out? Is a fruitless job search sending your sense of self importance south? Have you ever met someone who was unrelentingly positive in any situation and wondered how you could get a little of what they have? 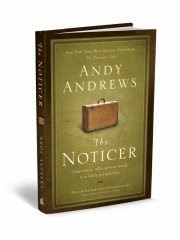 Please allow me to introduce you to a little fresh perspective in the form of Andy Andrews’ latest book, The Noticer. It’s the story of a man named Jones (or Garcia or possibly Chen) who manages to pop up in situations that seem hopeless. At least to the people stuck there! With some brutal honesty mixed with words of encouragement, he manages to change the course of an entire community. And how does he do that? By noticing some of the things that tend to be overlooked and pointing out that there is always a wider perspective. One nugget of wisdom is the idea that it’s really impossible to simply make a tiny difference. We may imagine our actions to be tiny, maybe inconsequential, but in truth, everything we do has far-reaching, possibly unimaginable effects. The truth is we matter, and the things we do make a huge difference - no “tiny” about it. This is something that mothers of young children need to hear often and repeat far and wide! It’s a short read and not particularly deep. You could finish it in a day or over the course of a week if you keep it in the car and pick it up while waiting for the kids to come out of classes. It’s just a book, but during a week with a sick child, an out of town husband, and a few deadlines that could only be met by giving up a night’s sleep, it made me feel like I’d had a nice chat with an old friend, complete with a warm hug and the encouragement necessary to make it through with my head held high. Who wouldn’t want a little of that? Get your hands on a copy today. Even better, look around you and get one for the person in your life in need of some noticing! Happy Birthday Grandma with the Big Truck!